Let's continue with studying parts of the body and the face. We will provide you with useful adjectives to describe how the person looks like. Furthermore, you will get an insight into the conjugation of the verb to be - "byť" and to have - "mať". 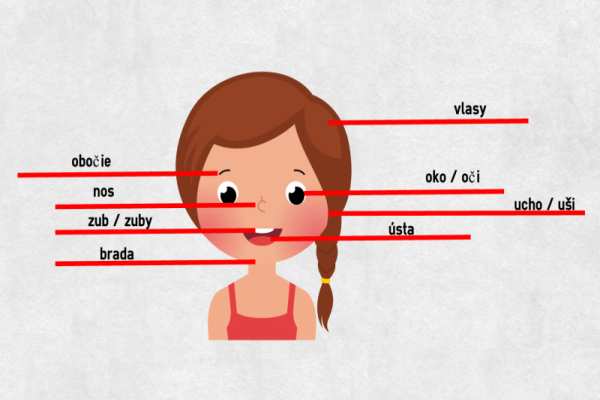 3.Conjugation of the Slovak verb "byť"
4.Conjugation of the Slovak verb "mať"
Here is a picture showing few of the main body parts. You can find more words below the picture, in a table with vocabulary. Here is the list with vocabulary, which you can see in the picture. Conjugation of the Slovak verb "byť"
The most important verb in general is the verb "to be", in Slovak "byť". Describing how the person looks like is mainly expressed with this verb. Let's have a look at the conjugation itself! Slovak language has both, singular and plural form of "you"
Conjugation of the Slovak verb "mať"
Let´s have a look on conjugation of "to have" in Slovak! Now, you are able to say how somebody looks like. With the simple verb "byť" and the adjective. Remember, adjectives change with the gender of the noun/pronoun. masculine gender with the affix "-ý"
feminine gender with the affix "-á"
neutral gender with the affix "-é"
Ona je prírodná. = She is natural. On je pekný. = He is handsome. Ty si atraktívny/a/e. = You are attractive. Mačka je múdra. = The cat is smart. Medveď je silný. = The bear is strong. Buď pokojný. = Keep still. Každý je unavený. = Everyone is tired. Dieťa je malé. = The kid is small. Moje oči sú modré. = My eyes are blue. Moje vlasy sú blond. = My hair is blond. Let´s recap this lesson in the dialog. Now you are ready to practice!